All Deaf Aotearoa offices will be closed on Friday 15th May. The first report, Disability Rights in Aotearoa New Zealand: Participation and Poverty, highlights barriers that can prevent disabled people from fully participating in society. Barriers are identified in many different areas of life including transport, public buildings, workplaces, technology, housing, cultural life and sport. The report also considers the impact of poverty on disabled people. The second report is Disability Rights in Aotearoa New Zealand: Acceptance in Society. In this report, disabled people explain the impact of discrimination and other people’s attitudes. Many of the disabled people interviewed have felt judged by the general public because of their disability. They report that this makes them feel excluded and often stops them from participating in activities. Some complain of being seen as different, or requiring ‘extra’ rights, when they are only asking to have the same basic human rights as non-disabled people. The report suggests that disabled people in New Zealand are being treated in ways that would not be acceptable to non-disabled people. The information collected in both reports will be used to monitor how well New Zealand is implementing the United Nations Convention on the Rights of Persons with Disabilities. The reports are produced by a coalition of disabled people’s organisations – the Article 33 New Zealand Convention Coalition Monitoring Group. Article 33.3 of the United Nations Convention on the Rights of Persons with Disabilities states that people with disabilities must be fully involved in monitoring the Convention. This conference is supported by new member group, the Bay of Plenty Association. Please click on the registration form to download. They will send out the programme shortly once details have been finalised. Come and experience fun and informal art classes that are suitable for total beginners. No natural talent required! Richard & Diana will take you step by step through their own unique process to teach you to draw realistically with fine detail. Small classes with lots of one on one tuition. Have a look at their Facebook page to see samples of the works that other students have achieved. Many of them came for art lessons because they couldn't draw. It costs $250.00 for a five-week term with 3 hour classes. Bookings are essential because there is limited space. Come and join us for a parade through the streets of Whangarei to celebrate performance, music and art and all the people who fill our city with colour! Dress in full noise and colour. New Zealand Sign Language Week so far has been successful! Our event at Westfield Manukau was a great start to the week, and we are looking forward to more events coming up this week! Our next two events are: Ellen Talk Show tonight and Karanga Plaza on Saturday. Articles about the two events are below! Come celebrate the rest of NZSL Week with us! Have you ever wondered what Ellen DeGeneres always talks about in her shows on TV everyday? Well, we have created a Deaf version of the Ellen talk show! This will be a programme full of guest speakers, entertainment, games and prizes, all in NZSL! We will have two very special guests coming on the night, you definitely would not want to miss this!!! The Deaf Aotearoa Auckland offices will be celebrating the end to NZSL Week at Karanga Plaza, where members of the public can join in on a full day of fun. The work of Deaf artists will be showcased. Deaf community members will perform entertainment. Representatives of emergency services will be present, showing the community just how good their NZSL skills are. We will also have sausage sizzles, bouncy castles, henna art, tie dye t-shirts, and lots more! Come down and celebrate with us! Rain or shine, we’ll be there. Direct from the West End, this superbly enjoyable production of Singin’ in the Rain is packed full of the charm, romance, comedy and tinseltown glamour of one the world’s best loved movies and features all the songs from the glorious MGM score including Good Morning, Make ‘em Laugh, Moses Supposes and the classic Singin’ in the Rain. With high-energy choreography and sumptuous set design (including 12,000 litres of water) Singin’ in the Rain showers you with everything you could wish for in a hit musical. There are a few spaces still available for if you would like to join the NZSL interpreted tour on Saturday. If you are coming, please remember bring proof of your address of residence. Only people who live in Auckland can get in for free. If you forget to bring proof of your address, you will have to pay for entry. It is close to Karanga Plaza where we are celebrating our beautiful language, NZSL. Come around and visit us. Or visit us then go on the tour! Walk through the museum and find the signs… At the end it will spell a NZSL Week themed word. Great way to encourage the young ones to come and learn the alphabet in a fun environment. Also, there will be a screening of The Sign of the Times DVD. You can invite your family and friends, or encourage your bosses to come along and find out more about Deaf culture and the history of sign language here in New Zealand. We will provide a nice warm room and hot drinks. If you can bring a gold coin donation and bring friend along with you, that would be great! Hope to see you there! Signing at the Cook: Quiz night! Who: Everyone is welcome. Children welcome if with an adult. Come and join in a quiz night for Deaf and hearing people! All questions will be asked in New Zealand Sign Language and also displayed on TV screen. Come as a group, or by yourself, doesn't matter, just join in and have fun! The quiz will be upstairs, on the mezzanine floor. For more information contact Kayte Shaw, Community Development Kaituitui, by email kayte.shaw@deaf.org.nz, text or call mobile mobile 021 517 791 or phone 07 211 4552. At the end of my hands: Thank you for all the support! On behalf of all the people involved in making the performance At the end of my hands, we would like to thank the Deaf community, and all others that supported the show by coming to watch it last week, making it a great success. Everyone was overwhelmed with the positive responses and feedback, and were very excited to have both nights a sell out! Laura Haughey (director), would love to hear your feedback. Your feedback will help with funding applications, so that performances like these can continue, and to encourage more opportunities for Deaf actors wanting get involved in theatre. Email your feedback to Laura Haughey at haughey@waikato.ac.nz. The office will be closed on Wednesday 13th and Friday 15th May all day due to staff meeting and staff working out of the office. Also, for your information, the office will be closed for two days at the beginning of June due to staff training. The dates for office closure in June will be confirmed closer to the time. Last Sunday, Deaf Aotearoa held a stall at Rainbow Springs. It was fun with fingerspelling names, face painting and more. 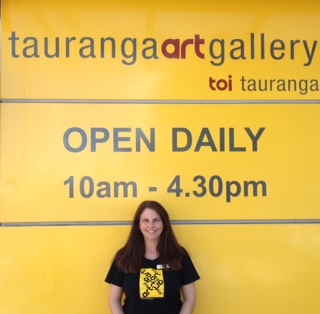 Come to the Tauranga Art Gallery tomorrow, Saturday 9th May, for a guided tour by Kelly who is a sign language user. See you there! Click on the flyer for more information including the address address and times. 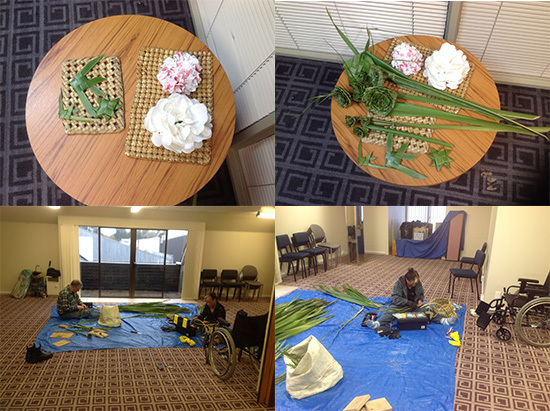 Anna Dubbelt set up a meeting the Deaf community here at Deaf Aotearoa’s office on Thursday 28th May at 10:00am. This meeting has been cancelled, with apologies from Anna. It's a chance for you, your family, household, school, organisation, workplace, or group to practise the right action to take during an earthquake (Drop, Cover and Hold) and make sure your emergency plans and supplies are up to date. Getting married? Visit this show to make your dreams come true. Free entertainment! Watch the professionals skate and skate alongside them on the smaller rink. Free to roller skate! There will also be face painting and Heena painting. We will have a visit from the New Plymouth Fire Department. Push all the buttons and pull all the cords to make a fire truck light up and sound noisy. Join us at the farmers market every Sunday morning from 9:00am to 12:00pm noon for your fresh local produce and products including fresh fish, bacon, dips, sauces, sourdough bread, jams, preservers, macadamia nuts and products, free range eggs, sauces, fresh seasonal fruit and vegetables, lavender products, plants, seedlings, herbs, healing products, soil conditioner and more... We also have live music for your entertainment and great coffee. Light your night at our annual Glow Festival and join the Let's Go team for a night ride along the Coastal Walkway. Make sure your bike is blinged up with plenty of colour and lights. Rides leave from the Huatoki Plaza at 5:30pm, there will be a shorter ride for the littlies and a longer ride for the older folk. The Rude Boyz are a roots reggae band from Maraenui, Napier. They are returning to the popular live music venue The Sideline Sports Bar in Napier to unleash their revisionist 70s style Jamaican roots reggae on the local Hawkes Bay audience. Over the last 12 months they have supported 1814, Herbs and Chad Chambers and have been working on their debut album which will include their popular original songs such as Spiritual Poverty, Redemption Time, Bring the Roots Back, and Feeling the Vibes. They will also introduce their newest original - Rude Boy. If you love classic roots reggae come and check out The Rude Boyz. This seminar covers how a home performs around its occupants and how the occupants can influence the way the home operates. It will also cover building design features that can help, or hinder, the health of the residents and the cost to run the household. Learn about heating types, energy efficiency, insulation, moisture control, ventilation, indoor air quality and more in this two-hour interactive session. This seminar is ideal for those who are uncomfortable in their homes—too cold, too hot, too damp or with high power bills. Also ideal for those on the property ladder. Learn how to protect your investment in property with simple changes to the building and the way it's used. The seminar will be delivered by qualified Home Performance Advisor and Manager of the Environment Centre, Sarah Grant. Or visit their website, all the information is available there for you to read. Sorry, we regret that there is no CommUNITY Weekly news for your region this week. Come along and join in the laughter at this year’s comedy festival. Take a look at the flyer to find out when and where this year’s NZSL interpreted shows will be. A big thank you to those that came along to Café Affair to start off our New Zealand Sign Language Week celebrations here in Nelson. We invite you to come along and have a fun game of indoor mini-golf at Roadhogs. We have 25 tickets available so please let Susan know if you would like to come along to the event. You are invited to attend the Circus Quirkus show. The Lions Club of Nelson have given us 30 complimentary tickets for our Deaf community, family and friends to attend the show. If you would like to go please contact Susan Peters on susan.peters@deaf.org.nz or text 021 939 415. 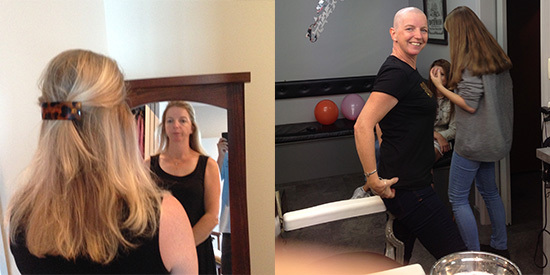 Becky decided to do something crazy thing for an amazing cause! Shave for a Cure is Leukaemia and Blood Cancer New Zealand's fundraising event. Every year thousands of individuals, schools and businesses across the country whip out the clippers and shave their locks in a bid to help the six kiwis a day diagnosed with a blood cancer or related condition. They receive no government funding. Becky raised over $1,000 for this amazing event. 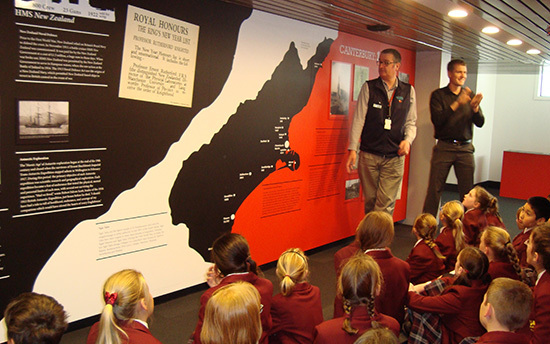 On Tuesday there was an interpreted tour of Canterbury Stories at the Airforce Museum of New Zealand at Wigram. A number of people attended and learnt more about the history of Canterbury. The event went well, see the photo below. Tomorrow, Saturday 9th May, we are providing an opportunity for you to jump aboard on our famous Christchurch tram rides and explore the history of Christchurch with commentary of the 17 history stops along the track interpreted into NZSL. There are two tram services you can book tickets for: 10:15am and 12:00pm. Seating is limited to 44. Note: Free tickets have all been given away. If you would like more information please contact victoria.green@deaf.org.nz or text 021 324 828. Do you suffer from dental problems but can't seek care due to cost? Do you have a current Community Service Card? The New Zealand Dental Association and the Southern Cross Health Trust are offering a free dental day on Friday 15th May. On that day you can have one dental problem sorted. There are three dental clinics in Christchurch that you can attend. Hornby Dental Centre, Bush Dental and Riverside Dental are providing their dental practices for use during the day. Appointments are limited so you need to book your place now by calling 0800 373 376. Note: They are expecting high demand for this services so an appointment is compulsory. Also be aware that delays are likely on the day, so please be prepared to wait. Please see the flyer for more information about our NZSL Week events. We hope to see you all there! Tour Dunedin on the double decker bus! Two interpreters will be there on the bus. Please tell me if you’re coming before Thursday 7th May. This year we will have the opportunity to vote on the future of the New Zealand flag. There will be two referendums: one in November 2015 and another in March 2016. In November, we will have the opportunity to vote on possible flag designs to go up against the current flag in the March referendum. Then in March 2016, we will have an opportunity to vote on whether to keep the current flag or change to the most popular option from the first referendum. The Flag Consideration Panel will be responsible for deciding what those options will be, and New Zealanders will get to be part of that process. Former Dunedin Mayor, Peter Chin, is a member of the Consideration Panel. Look out for more from them later in the year, and they will be announcing the options before the first referendum. The Electoral Commission's job is to get people enrolled and ready to take part, and then make it as easy as possible to vote at referendum time. Both referendums will be held by postal vote, so it’s important to make sure that your enrolment details are up to date. It's easy. Full information in New Zealand Sign Language about how to take part in the referendums will be available at www.elections.org.nz later in the year. Or email Dee on dee.vickers@elections.org.nz if you need additional help or information. There have been some really good feedback from people who attended our taster classes held here in Invercargill. Special thanks to our tutor, Roxanne, who is doing a great job and seems to be breezing through the schedule without any hassle. Next year might see a demand for more classes which is a positive thing. Thank you to Hine and Stephen Clover who volunteered their time on Wednesday with the Crafts Day. I thoroughly enjoyed it. We made some beautiful flax flowers, fishes, stars and paper roses. I really appreciate your help and hope to do it again. For those who are taking part in the First Aid course on Monday 11th May, please remember to be prepared because it will be a long day. Happy NZSL Week, and don't forget about Mothers Day on Sunday 10th May! The coffee group for Thursday 21st May will be cancelled because Rebecca will be in Dunedin. The office will be closed on 19th, 20th and 21st May. In case of an emergency please text Rebecca and she can arrange alternative arrangements. Register online before 1st May 2015 to receive your dri-fit style T-Shirt. This is a non-refundable event with donations made to the Heart Foundation.